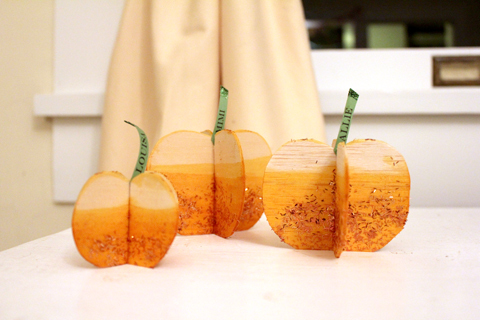 For Thanksgiving dinner at my parent's house, I made pumpkin place cards based on this tutorial on Oh Happy Day. 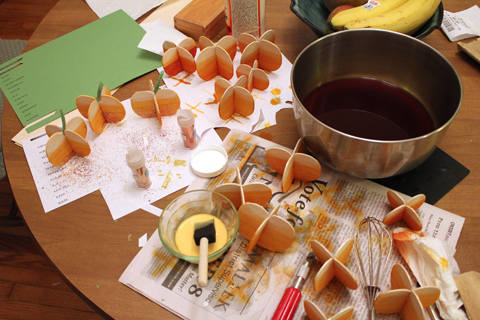 The tutorial is lacking a few important details, like what kind of craft wood to use, and how to mix the dye. A complete novice to the craft-wood world, I bought both balsa and basswood at Michael's. The basswood split like crazy when I cut it, with scissors as the tutorial instructs, and also with an xacto. 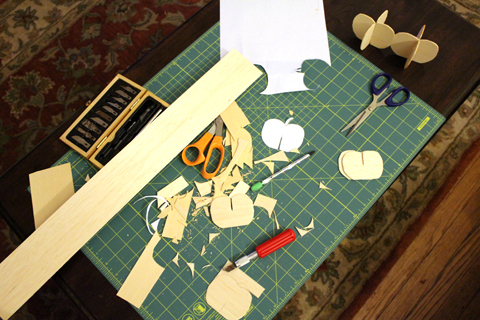 The balsa was easier to cut, but still split often, and it was impossible for me to cut the stems out of the wood. I think I needed an even thinner wood. I had 1/16" x 3" strips. Selection was limited. The other problem with the balsa was that it absorbed the dye too much, so the gradient effect was almost impossible to achieve. The couple that I was able to make out of basswood without splitting held the dye a lot better, but they were much too hard to cut. I also think I made my pumpkins too big. The tutorial didn't include a template or even a rough measurement. Mine were probably under 3" wide at their biggest point, but when they got to the table they looked probably 30% oversized. 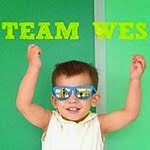 I make my stems out of the name-flags, printed in Engravers typeface on green scrapbooking paper. I added some orange tinsel glitter I had on-hand, and some fine green glitter to the tops of the stems. Perhaps not as chic as the ones from Oh Happy Day, but they did their job and left plenty of glitter in their wake. 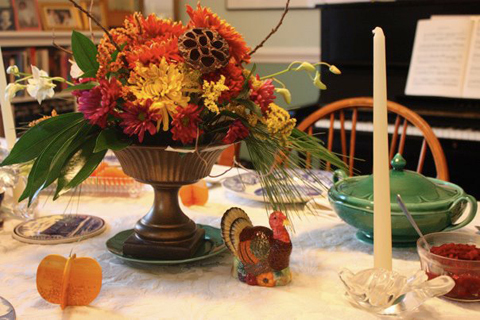 That gorgeous flower arrangement on our Thanksgiving table above was made by my Grandmother and my sister. My other sister took that photograph.